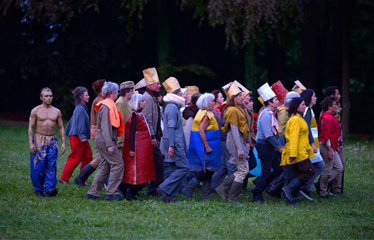 Mime theatre maker Boukje Schweigman (1974) develops the musical movement performance Erf (“inherit”). The show is performed by local players alongside professional actors. Erf is a play with ritualistic features about intangible legacies, family ties and location history. The substantive point of departure is the origin and belonging of every man to his biological and cultural history which is passed on through the generations and place of origin (touching on the different meanings of the word “erf”. Ammodo supports Erf to contribute to the artistic development of Boukje Schweigman.